Movies Like Divergent (2014): Dystopian Worlds '+g+"
Divergent is a 2014 sci-fi action-adventure film based on the best-selling novel of the same name by Veronica Roth. The movie is set in a dystopian society where people are divided by factions based on their virtues, Tris Prior (Shailene Woodley) learns she's a Divergent who won't fit into any one of the factions. When Tris uncovers a conspiracy to destroy all Divergents, she along with the mysterious Four (Theo James) must find out what makes being Divergent so dangerous before it's too late. Like watching more action-adventure movies like Divergent (2014)? 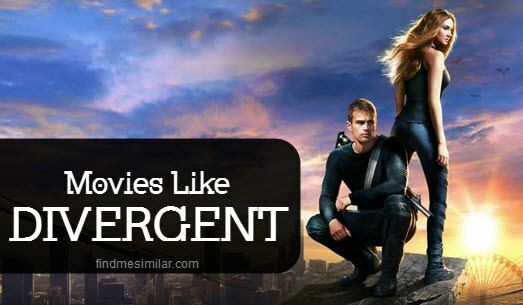 then check out this list of recommendations below for movies similar to Divergent (2014) and don't forget to mention if we miss any other movies similar to Divergent as we keep on updating this list. The movie is based on the best-selling novel of the same name by Suzanne Collins. The story follows 16 year old Katniss Everdeen (Jennifer Lawrence) who volunteers for her sister's place in 'The Hunger Games' a nationally televised fight to the death contest where the youth from twelve districts of Panem compete against each other until there is only one remaining. The Maze Runner is a 2014 sci-fi adventure thriller based on the bestselling novel of the same name by James Dashner. The story follows Thomas (Dylan O'Brien) a 16 year old boy with no prior memory trapped in a giant maze with a group of other boys. He must now discover the secrets of his past and a way to escape the deadly maze. The Giver is a 2014 sci-fi drama based on the novel of the same name by Lois Lowry’s. The movie follows Jonas (Brenton Thwaites) a young boy living in a seemingly perfect community, finds out the dark and deadly truth behind the community’s past and now he must escape to protect those he loves. The Host is a romantic science fiction movie released in 2013. Earth has been invaded by body snatching aliens who are making humans as hosts for their invaders, Melanie Stryder (Saoirse Ronan) will risk everything to protect the people she cares most about. Death Race is an science fiction action thriller film starring Jason Statham as Jensen Ames a wrongly accused has only one way to get his freedom - winning the death race by killing others in the race. Lord Of The Flies (1990),....if you can think of more, then don't forget to mention it in comments.